SIMPLE ELEGANCE SURROUNDS YOU. THE TIMELESS WARMTH OF TEAK. TEAK, IN COMBINATION WITH HANDCRAFTED SOFT CLOTH CEILINGS, MEANS YOU'LL HAVE NOT ONLY A YACHT... BUT A HOME. Caliber Yachts introduces the LRC SEries (Simple Elegance) models. Improvements have been made to both the technical engineering features for which Caliber is renowned, plus dramatic interior enhancements as well. From the premium gloss finish of the teak and holly sole, to the hand-crafted soft interior headliner, the interior has no large, labor saving, cold hard fiberglass liners to disturb a truly livable interior. One step into the cabin, and you'll immediately feel the warmth that completely surrounds you. 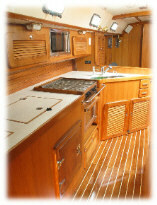 The interior reflects the timeless beauty of teak taken to a new level. Simply put--Simple Elegance. Detail touches include upgrades to the cabinet doors. Positive-locking, flush mounted pulls are now standard. Pulls that insure the doors will stay closed even in rough seas. Also, cabinet lockers are ventilated with aesthetically pleasing, teak batten louvers. Passageway doors have been completely redesigned. They are 7/8” thick and incorporate teak panel inserts. 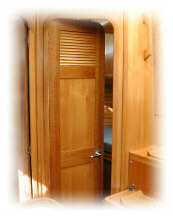 As with the cabinet lockers, ventilation is insured by the insertion of teak batten louvers. The doors have also received a hardware upgrade with positive locking handles, chosen for aesthetics as well. Slide-away SkyscreensTM are now standard on both the 40LRC SEries and 47LRC SEries models (optional on 35LRC SEries). These are built-in and flush mounted in the ceiling, framed by teak. Not only do they look good, but they are highly functional as well. If the sun is directly overhead, heating the interior, a simple pull of the shade draws it closed to block the sun quickly without blocking all the ventilation. At night, if you want to allow air to flow, not insects, then you can simply pull the screen over the opening and you have a well-sealed barrier while still ventilating the cabin. Previously, the heads already had great storage volumes. Now storage has been made even more useable with extra shelves and cabinet door changes. Plus, the added luxury of Corian countertops is now standard on the 47LRC SEries models (optional on 35/40LRC SEries models). Solid teak battens are available on the hull sides in the main salon. It’s a cosmetic change that creates a cozy atmosphere in addition to adding a yacht-like feel. 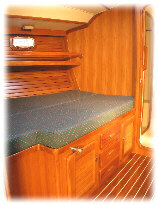 Teak battens are also available for the sleeping cabins. Improvements in all the galleys are numerous. Starting with an unseen one, the expanded foam insulation in the icebox has been increased even more for superb refrigeration efficiency. Additionally, the drainage system has been improved to help lock in cold while draining away water. The heavily insulated icebox lids, with their high thermo characteristics, now have a gas-assist lifting device to make accessing the icebox easier. Other improvements have been made to the cabinetry. In the already maximized storage volumes, more useable space has been created with changes in existing shelves, and the addition of even more shelves. These cabinets are now well ventilated by the use of teak louvers on all the doors. Even a microwave oven is standard with a custom built installation. In creating the SEries of yachts, Caliber has created not only a more functional interior, but one that will stand the test of time. A warmth you’ll never tire of. This makes your investment in a Caliber one you can trust is not faddish. Caliber LRC SEries models are every bit as appealing today, as they will be many years into the future.